AMG has announced the name of Project One. The electric supercar is called ” Mercedes-AMG ONE”. All 275 copies have already been sold, however, AMG provides the contracts with certain clauses to protect the Hypercar from speculators. It’s like in the real estate market . There are buyers who purchase a car just for the purpose of reselling it as expensively as possible. They do not want driving pleasure, but maximum return. Then suddenly exclusive cars with zero kilometers appear on the speedometer on Internet sales platforms. At twice, three or four times the price. The Porsche 911 R was such an example. Ford protects his GT with clauses in the contract against speculators. Customers must hold the supercar for at least two years. Violation threatens a lawsuit. 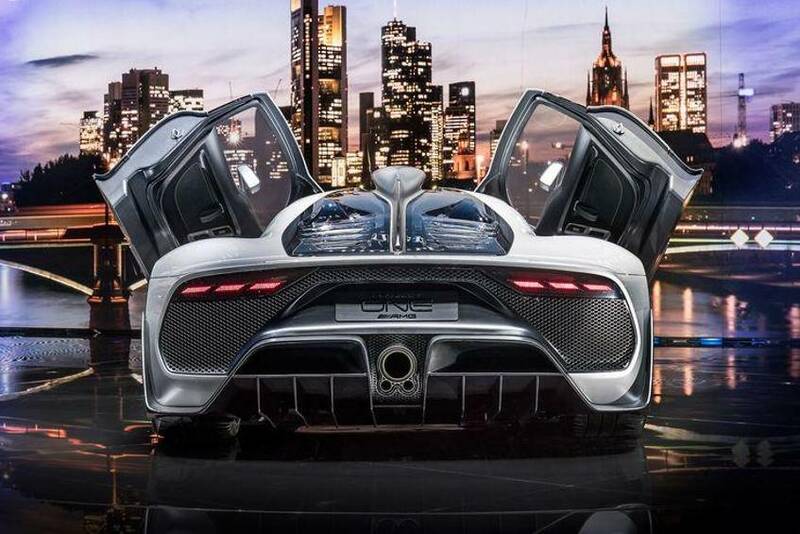 Mercedes is following a similar path with its prestige project One, which will be handed over to its first customer hands at the beginning of 2019. All 275 copies of the Hypercars with Formula 1 technology are sold. It took just over a year just the announcement to build such a car . To keep customers on the hook, an exclusive and mobile show truck informs about the development progress of the AMG ONE. It is extendable and offers, in addition to the vehicle display, a coffee bar, a lounge as well as various information elements and color examples. Seating in the cockpit is also possible, as is the demonstration of the individual equipment options. The total price amounts to 2,275 million euros plus taxes. The buyers had to make a down payment in a first step. The purchase option agreement includes a bilateral right of withdrawal. Mercedes-AMG keeps its eyes and ears open, scans sales platforms and vehicle exchanges on the Internet to rule out direct resale. It is said that one or the other over corners praised the Project One. In such cases, Mercedes-AMG then grazes in between. Even in the purchase contract itself, there should be clauses that protect the Hypercar from becoming a speculative object. The first test drives have already been undertaken by Mercedes-AMG . With camouflaged prototypes on closed racetracks in England and Spain . Public roads still avoid AMG. The chassis for the One is built in England . About half an hour northwest of the Formula 1 engine factory in Brixworth , where the engines of the Project One are manufactured. The short connection facilitates the development. For tests, Mercedes-AMG uses two test stands in Brixworth , and may also use the Formula 1 test bench on occasion. The 1.6-liter V6 turbo is based on the 2015 Formula 1 engine. However, it will also incorporate developments from recent years. The current engine does not want to take. There are too many secrets in it. System performance between 1,100 and 1,200 hp can be expected. Mercedes-AMG slowly gropes to the limit. During the first test drives of the V6 turbo turned to 9,000 / min. The goal is 11,000 / min for the street version. Meanwhile you are in between. The engineers first have to harmonize the powerful engine with the automated eight-speed gearbox. The Mercedes-AMG One rolls on semi-slicks to the customers. But also completely profileless tires are being developed. However, the slicks are only delivered when driving on the racetrack. It is no secret that Mercedes-AMG wants to set a new record for road cars on the Nordschleife with the One. The best of the race car Porsche 919 Hybrid Evo can not be reached. For Mercedes would have to show up with the Formula 1 car on the Nordschleife. The One, which initially exhibited the Swabians as a show car at the IAA, is based on a carbon monocoque. Behind the passenger compartment beats the heart. A mid-engined 1.6-liter V6 turbo that once served in Lewis Hamilton’s and Valtteri Botta’s racing cars . Neumatic instead of mechanical valve springs allow a maximum speed of 11,000 / min. Theme Lewis Hamilton : He drove the Project One study in Frankfurt on the stage. The high-speed concept sounds more like a motorcycle than a street sports car, but it does not quite reach the level of Formula 1 in terms of performance . For efficiency reasons, the crankshaft rotates between 12,500 and 13,500 times per minute. Almost 15,000 / min would be allowed. A limited fuel flow of up to 105 kilograms of gas per hour forces the engineers to compromise. They therefore limit the boost pressure to about 4 bar. The Hypercar does not have to deal with these restrictions. It can burn so much Super Plus (instead of racing gasoline) until the tank is empty, and boost as much as the AMG engineers allow. The speed limit ensures a longer life. A motor mileage as in Formula 1 would be unreasonable for customers. AMG sets the first revision to 50,000 kilometers. An electric turbocharger pre-compresses the intake air for the V6 with four overhead camshafts that drive spur gears. Turbine and compressor are separated here. The one wheel sits in the exhaust, the other in the intake. They are connected by a wave. On this shaft is the first of four electric motors. This electric machine, called MGU-H for Motor Generator Unit Heat, works on the one hand as a drive to plug turbo holes, on the other hand as a generator to fill the batteries. In the latter case, the MGU-H uses the energy of the h#t exhaust gases. The second electric motor is called MGU-K (Motor Generator Unit Kinetic). It converts kinetic energy into electricity during braking and is directly connected to the crankshaft via a spur gear drive. The MGU-K provides 120 kW (163 hp). With this drive configuration, the Formula 1 car achieves over 950 hp in qualifying mode. AMG hangs two more electric machines on the front axle. Both are co#pled via a reduction gear to the wheels. These e-motors, each releasing 120 kW, which is practically two more MGU-K, are not available in Formula 1 , and let the Hypercar be stronger on paper than the race car. The powertrain operates at a voltage of 800 instead of the usual 400 volts, which should allow, among other things, particularly fast charging of the plug-in hybrid. The Ansteckvorrichtung this is located on the right side of the vehicle. The fuel tank cap is replaced by Mercedes-AMG on the left side. Accurate performance data conceals AMG. Torque? No information. However, supplier ZF, which builds clutches for Formula 1 , has a benchmark from last year. That was for the F1 powertrain: over 1,200 Nm. In addition theoretically still the torque of the two E-machines would come at the front. In Formula 1 , the output of the MGU-K is limited to a maximum of 200 Nm. The maximum speed AMG dare to over 350 km / h. These are regions where Lamborghini Aventador and Pagani Huayra play. Bugatti Chiron , KoenigseggAgera and Regera RS even run over 400 km / h. Zero 100 km / h? Rumors about 2.5 seconds. So Chiron level. The 200 km / h should fall below six seconds. The battery packs in the underbody correspond to the structure, the cells and the arrangement of the memories from the F1. However, AMG increases storage capacity fourfold. This increases the battery weight from 20 to 25 (F1) to around 100 kilograms. The weight of the drive unit goes up from at least 145 (F1) to around 420 kilograms. For the total weight makes Mercedes-AMG no information. That’s why the power to weight ratio can not be calculated. The Project One allows different driving programs, including a purely electrical mode. Then only the e-machines work on the front axle and bring the AMG a good 25 kilometers. The electric motors on the front axle can decelerate and accelerate the wheels, so you can use torque-selective torque control. When towed, they collect up to 80 percent of the braking energy. When the pilot gets full power, the Project One is an all-wheel drive. The power transmission is an automated eight-speed transmission. A dual-clutch gearbox or a converter would have been too heavy. The transmission from Formula 1 was also not an option. Because it would be too loud and rough for the general traffic. Active aerodynamic solutions such as the gills on the top of the front wheel arches and the two-part, extendable rear wing are to guarantee outstanding driving dynamics as well as the pushrod suspensions. The struts activate the spring / damper units. The Hypercar stands in front on 19 inch wheels. On it draws Michelin specially developed Cup tires (Pilot Sport Cup 2) in size 285/35. On the rear axle, the technicians mount slippers of size 335/30 ZR20. For comparison, the tire size of the Mercedes-AMG GT R: 275/35 ZR19 and 325/30 ZR20. The 10-spoke aluminum forged wheels with central locking developed new. They have a radial, aerodynamically sophisticated part cover made of carbon. This should improve the aerodynamics and push the cW value by a better flow around the wheel. At the same time, three flat ventilation slots per each spoke section ensure optimized heat dissipation from the brakes. A carbon-ceramic brake system delays the hypercar. The look of the Mercedes-AMG Project One is characterized by large air vents that run the entire front apron, narrow LED lights, an advanced cockpit, a roof hatch, an adjoining shark fin and a large diffuser. The airbox on the roof provides the engine with fresh air. The rear window allows a view of the V6 turbo and the rear pushrods. The sunken ventilation ducts, so-called NACA ducts, allow cooling air to penetrate all the way to the engine and transmission radiators. In addition to the central tailpipe, AMG places two small tubes. They imitate the wastegate tubes from Formula 1into which part of the excess turbo pressure is directed to make the V6 engines louder. For road use, the engineers have to treat the exhaust gases and dampen the noise a bit. In the cockpit, the spirit of Formula 1 dominates, The cockpit, however, accommodates two people. The bucket seats can not be adjusted in the longitudinal direction. For this, the driver can adjust the steering wheel, the pedals and the backrest. The steering wheel with integrated airbag is flattened at the top and bottom – like in a racing car – towering above the first of two ten-inch screens. AMG is installing the second one above the sparse center console. You look in vain for a rearview mirror. Instead, there is a mirrorcam on the headliner, which imports the driver, what happens in the rear. A classic mirror would not have been sufficient due to the limited view through the fin on the roof. The carbon-clad doors are pulled through loops. Smaller utensils can stuff the inmates into storage compartments. The Hypercar also has air conditioning on board. PREVIOUS POST Previous post: “The Incredible 2”: Only fun in the cinema for the whole family?